If you are working with Fannie Mae properties and your offers are coming via HomePath, you can use the information from HomePath to populate offer information in Broker Brain. This can be done when entering new offers, or to update existing offers. In order for the autofill feature to work properly, you must first bookmark HomePath on your Web Sites tab. Click here for information on how to do that. 1. From the desired property, go to the Offers sub tab at left. 2. Click the + adjacent to Add Offer to expand the screen. 4. In the fields provided, enter the offer's HomePath Offer ID, your Login Name, and your Password, then click the Fetch button. The offer information will be added into the Add Offer screen below. 5. Add any other desired information, then click the green Add button at the bottom of the screen. If you do not click the Add button, the offer information will not be saved into Broker Brain and you will need to go through the above process again. 6. Click the Notes tab. Information from the Fetch will be displayed as a note, along with any documents that were uploaded with the offer. 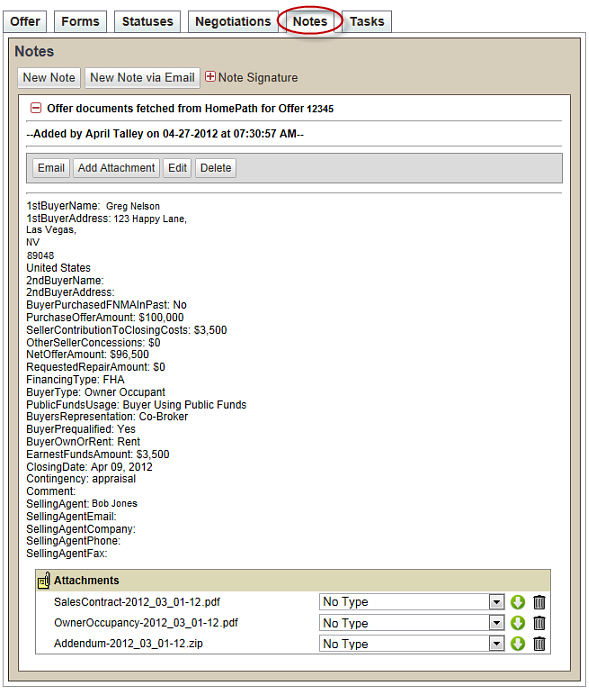 Documents are shown in the Attachments section at the bottom of the note. Attachments can be downloaded by clicking the document's green arrow.